Rum-Punch Drunk: Please, Help Me To Die! As you start to read this you get a call from the hospital. The love of your life (whoever that may be) has had a serious accident. You arrive at the hospital as next of kin, and you are told by the consultant that your loved one not only has a slim chance of recovery but if they do recover (in the doctor's opinion) there is a possibility that they could be severely disabled physically and mentally for life, and will need 24/7 care day and night. Within days you are given the option to say your goodbyes and turn off the life support. What would you do? And this is where I need your help. For those of you who said yes, do you feel that you have assisted someone to die, irrespective of who turned the switch off? Right now in the High Courts of the UK there is an ongoing case regarding a man called Tony Nicklinson who had a stroke 7 yrs ago and now has 'locked-In Syndrome', meaning that he is trapped inside his own body. His mind is unaffected, but he is paralysed from the neck downwards, he communicates by blinking (using a computer) and says his 'life is a living hell'. His legal team is at the High Courts petitioning for his right to have an assisted death as he is physically unable to end his own life without assistance. I'm not trying to provoke a religious argument on life or death, but rather look at the wider implications that this can have on all of us in a matter of years if this case succeeds. Could this be the thin end of the wedge? A trojan horse for full euthanasia. Could this 'right to die' case today be extended tomorrow to people suffering from any debilitating illness? Later still, could it not broaden even more, to those who have disabilities that are too hard to cope with, or further still, to the elderly who can't look after themselves? Can you see where I'm going with this? After all, wouldn't it take a great pressure off the National Health Service system, freeing up valuable resources? Wouldn't it lessen the burden on carers? This has already happened with 'abortion'. It seems to me that it is being used more and more as a viable option for birth control, rather than what it was originally intended for. Now on the flip side of all this, suppose the person did recover, but had severe mental and/or physical impairment? We may have no idea how much pain that person may be suffering. It is fortunate that Mr Nicklinson can communicate, even just by blinking his eyes. Otherwise, how would we know when they are in pain and when to give medication to ease it? If we knew when to turn them over they wouldn't get bed sores. If we knew when they wanted to go to the toilet, they wouldn't have to wear nappies/incontinence pads, and suffer more indignity every time they soiled the bedding. If we knew what they wanted to eat we wouldn't be giving them half the stuff they may not like or probably force them to eat it, when if fact they weren't actually hungry. We wouldn't turn the light off putting them to bed when they weren't even tired. The reality is, that most people cannot afford to pay for care, so it may be a family member who gets to do all this. What a flip side. And to muddy the waters even more, what if the doctor's prognosis was wrong and they happened to be the 1 in a 1000 that made a full recovery? After all, doctors can make mistakes. 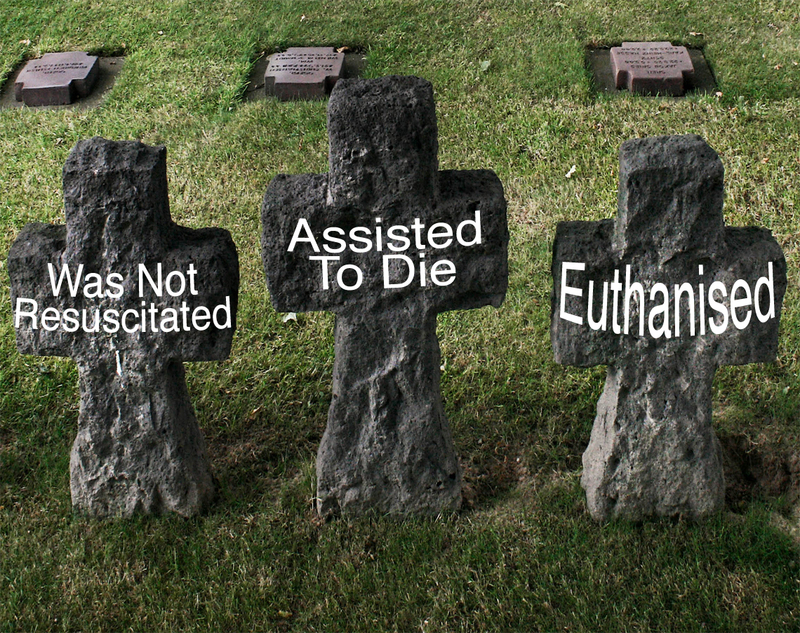 Would anyone like to clarify how you view assisted suicide, 'do not resuscitate', euthanasia, or 'the right to die'? I'm really interested to hear your views on this, particularly if you have had to care for someone or have medical experience of this issue. Aren't doctors supposed to save lives and not assist you in dying? There is something to be said for quality of life. My wife and I have discussed what we want done in these types of situation and I believe if somebody wants to die they should be allowed to. If somebody can actually communicate to you that they want to die, by all means, let them go. Thanks Louie Van Deven, I like the thought that you have discussed this with your wife because, at the end of the day, you never know when either of you may be put in such a position, and it somehow makes it easier for the one left behind when they know what you would have wanted. I really think a human should have a right to die with dignity. We put down animals in pain and dying to be humane, when they cannot voice if they want to die. We make that call. Why a human being who can voice their choice cannot exercise that choice I will never understand. Slippery slope arguments aside, the right to a humane death rather than live in constant pain with no quality of life should not be reserved for animals with no voice. A doctor shoudl be both, to help you live, and when all efforts have been exhausted, if the patient so chooses, help then die with dignity in their time. Great point Jamie about what we do to animals in pain, I wasn't even thinking about them. I'm kind of thinking about the rest of what you said because I know of a couple of people who would be dead today if they had had, the 'right to die' at a time when they were in the 'darkest of hell' bouts, but instead have learnt to cope with their severe illnesses/disabilities and are alive. But the choice to die is permanent. It's a big adjustment learning to live with a debilitating illness etc, and that process can be arduous. My concern would be that if the right to die is granted instead of seeing that process through, a person may opt to have their own life taken, when they don't really know if there is a possibility they could have still found a meaning and quality in their remaining time. Thanks Jamie. Honestly? I don't want to be in this kind of situation. Please...God forbid. Right now, I don't want to entertain this question in my mind. Whatever happen in the future, I'll cross the bridge when I get there. Thanks for your comment JoanRB. Just a thought, God forbid anything was to happen to you, but can you be sure that your family/friends would know what you would have wanted if the worse was to happen? As a wild example, what if your mother said to let you live, and your father said to let you die, then your children intervened saying don't switch off the life-support, followed by your husband who said switch it off etc? With nobody knowing what you would have wanted, would it not destroy the family you left behind? Just a thought of mine (devil's advocate) and I'm not asking for you to change your way or reply if you don't want to. Very Nice article. In my opinion if the concerned person wish not to live then it's fine if the death is allowed. Thanks for your opinion on this sskcorp. Really, I've read some of the comments here and it looks like those who say yes to killing us off don't know what is it like to be in pain. Pain that makes you feel as if you want to die, and many times I have felt like dying. I know that I will die one day but what the hell. don't we all wish to die when we are in severe pain but what about the days when I can tolerate the pain with medication even if it was for 10 hours. when my pain is not as bad I want to see my family who help me cope with life, so although I know that the end will come eventually and the pain will get worse I want to live just that bit longer. I am able to say that now as I can communicate but what I hate is when people think that you should be killed because they want to turn off your life support because THEY feel they know better. Maybe they are the selfish ones because they don't want to be the ones who clean up your mess, just like you said in your post. We need to be careful what we wish for because when it does happen you may not want to be killed but because of what you said before you might end up dead. First, no one is talking about killing anyone off. Second, I'm pretty sure those fighting for the right to die with dignity DO know what it is like to be in pain. Way to assume everyone who has been in pain thinks like you. I know several people who live with terminal illnesses and most of them would like to be able to control the indignities they do not wish to suffer as they get to the end of their journey. Killing someone off is kind of a blatant way of putting it, because often the pressures on a person can be subtler. Imagine a society where some high profile cases of people choosing to end their own lives cause it to become increasingly normalised. Imagine the sea change in attitudes this would create. People afflicted with an illness which forces them to rely on others often tend to feel like a burden, even if it's not logical. Feelings work that way. In an environment where opting out of life becomes an accepted option how could we be sure that a person isn't choosing to exercise their right to die as a way of removing a perceived burden upon their loved ones - whether the loved ones see it that way or not? They begin seeing themselves as the obstacle to that carer's career. Maybe it's their son or daughter and they're getting older and still haven't met that certain special someone because of their duties of care. A person who may not want to die may get the sense that the right thing to do is get themselves out of the way for the sake of others. Fast forward a few more generations and the culture may begin to view people who choose not to end their lives when they are no longer self-sufficient as selfish or spongers. These are my concerns. At the same time I am acutely aware of the HUGE gulf between watching a documentary about this sort of thing, even knowing someone who is going trough it, and actually being that person trapped in their own body. That person who suffers intolerable pain all day, every day. It is an awareness that makes me very cautious in voicing my opinion. It makes me feel like Moses when he was told to take his shoes off and tread carefully... to listen to the voices of those in that situation, speaking to us from their hell on earth... to try and hear what they say about this issue with respect and reverence. Who knows, one day it could be me. Thanks for your thoughts on this topic, and I am sorry that you are going through so much pain and commend the way you cherish the moments you have with your family. I don't think any of us are selfish for having opinions on any given subject, hard as some of them are. All we are trying to say is what our points of views are, given the information. We sometimes have very hard choices to make in life and yes, maybe someone does not want the burden of looking after a person as described in this post. At the end of the day, anyone of us can unexpectedly be in the same position as Mr Nicklinson, and I just feel that more people should talk about the 'what ifs', just in case. I truly appreciate your honesty with your comments though. Thanks again. Very well put indeed, it really does make you think about both sides of the argument. Thanks for commenting on this. This post is very thought provoking albeit a bit morbid:) But I like how you are not afraid to "go there" My view: If you are of sound mind, then it should be your choice. But if you can't take your own life (because of your physical impediments) be prepared for objections it is a natural part of the human process. Thanks Roxy, you hit on an important point. You said 'I'm not sure what kind of life you are living if you are mentally unaware'. Can you just imagine if the person lying on that hospital bed was aware of everything that was being said and done but could not communicate or move? and further still, family and friends around them deciding their death? what a thought, as wild as it may be to some. Thanks for your comments here as well. I guess I am always at odds with the current affairs! In this field, we must try to understand the relationship between life as a prisoner in our body (even if in very good health) and the despair a mind can be immerse in if there is no way to communicate with the external world. logical scent of sadness and grief. As always this is my opinion and not the holy truth. the vaults of the body! My first physical reaction is, "let me die with dignity". My second mental reaction is, "but what if I can develop another kind of life"
My third psychological reaction is, "are you out of your mind? there is no proof of ever happening that"
But then again "Who knows?" In a more seemingly human situation it goes easy, if the person can decide, that should be the procedure. educated options of a group of doctors qualified to assess the situation. Stephen Hawking is a great example of someone trapped in his own body and has made a brilliant career, though I dare not touch on his points of view about assisted death as I have not researched this or read his books. I too feel the same way about not being able to imagine being trapped in your body but with a mind that is still active. It's a hard thought, and I entirely agree with what you said about what your first, second and third reaction might be, the main problem being if you stopped at the first point without having time to develop the other points. I have really been thinking seriously about all these comments, concerns and what if's. I love your blog - the topics are always so thought provoking and you incite fabulous discussions, which is why I'm passing the Fabulous Blogger Ribbon Award on to you! Many congratulations:)The guidelines for accepting the award are on my latest blog post on Go Momma! This is why I believe in Living Wills, so my family only needs to do what I ask, and that alone would be a difficult thing for them. I honestly believe in a life after this, and people kept on missions who are not conscious are caught between both worlds. Heartbreaking. This is one of the toughest choices in our world today. The idea of a 'Living Will' would help those left behind know that you made a sound, conscious decision should anything unfortunate happen to you, even if it would be very difficult for them to do. Thanks Donna. A very provocative post indeed, RPD. As a physician, I am obliged to do good and to do no harm. Heroic measures can do good, as well as doing harm. Exploring and understanding a patient's advance directives pre-operatively is most helpful in discerning which interventions he/she personally considers to be good or harmful. Thanks for commenting Kris. Let's say a patient makes the informed decision that in their view, having their life terminated is not harmful, but the best solution in their opinion. Based upon this, would respecting their wishes objectively constitute harm or not? I feel human beings are not that authorised to let kill somebody. 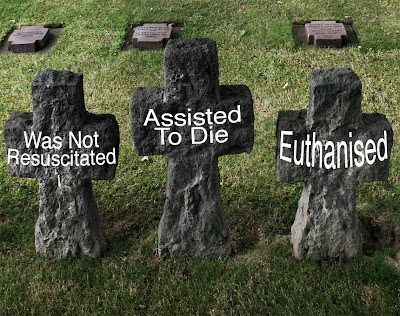 Euthanasia is also a petition to let the person die. But the person removing life support system would in turn be a killer. Atleast I would never do this. It isn't that I don't respect the patient's feeling but still, I would never support this. I'm not comfortable with the prospect of human's playing God either. But as our technology increases, so does our power over life and death. As a result, these choices become increasingly unavoidable. I find this difficult as well, and discussions like this help me to get different perspectives to make an informed choice, should the need arise. Thanks Esabella. Almost all cases of 'pulling the plug" claim that they are relieving the person from pain, suffering and doing them good by pulling the plug. Hmmm.. Yes, the person is suffering. agreed. But how do you (or the patient or any living being for that matter) know what is awaiting him on the "other" side of life? What if it is pain greater than what he is suffering now? What if he was supposed to bear this pain in life, so he can have a better after-life? Well, nobody knows , atleast not until you are dead! And about the patient wanting it himself. A friend once told me she wanted to end her life cos her boyfriend broke up with her. She was miserable. I felt for her. but hey, I dint push her off the cliff just just like she wanted me to, even though she was suffering.. I really don't know what's awaiting us on the other side, be it good or evil, greater pain or none. I've never personally met anyone who has returned from the dead to tell me :). But being serious, it looks like the friend was trying to put the onus on you for something that she is responsible for! her own life and emotions. It was wise of you not to fall into that trap. We have responsibilities towards others to support them etc. But only for ourselves in these types of situations. Thanks Nina, and hope to hear from you again. I've just read this post, even though it's more than a year old, and it reminded me immediately of the situation we faced with my mother back in 2002. After a series of mini-strokes, she didn't recognize any of us, and as you can imagine that was very hard to take. I remember taking the phone call from the hospital that she'd died, and my immediate reaction was one of relief! The end of life is a difficult area, and I've thought about it more and more in the past decade, and my hope is that I don't end life like my mum, who I suspect was aware of what was going on but could do nothing to influence it. It's one of those things that can play out one way in theory and completely different in real life. I mean, we all respect the dignity of life, how precious it is and how the loss of each and every human being is something of inestimable value. And yet, at the same time we have to accept that no-one lives forever and things can get to the stage where death comes as a release, bringing peace not only to the deceased person, but to those who live on. In spite of the pain of loss. Is that something we should feel guilty about admitting? In theory, no, but as I said at the beginning, reality is far, far more complex. Very thought provoking, as indeed are all your posts. As someone who lives with CRPS I live in constant and severe pain. This in turn drives depression leading to an affect I refer to as 'the spiral of doom'. Increased pain leads to increased depression which makes pain more noticeable, as the depth deepens thoughts turn from unhelpful to harmful. Now I have a number of mind games to help interrupt and even reverse the spiral, the question is do I want to? My prognosis is not good, in fact it is horrendous, I am expected to live a normal life span, but the pain will continue to worsen. I might get better at masking it, but gradually, as it has been doing for almost 6 years, it is getting worse. I have lost count of how many times I have had to review what the doctors call a 10 on the pain scale, (the worst pain you can imagine). The pain management team I work with told me to establish goals, they were dismayed when I delivered a perfectly formed SMART goal to end my life. This brings me to address the issues you have presented. Life is a precious gift, but it is a gift given to each of us as individuals and it is, in my opinion, right that we should each be allowed to decide when and if we are prepared to end it. I have to caveat my answer with one, very important, point. It is imperative that we communicate our intentions with our loved ones. Where possible they should not have this sprung on them suddenly. At the end of the day, most people would be prepared to put a pet down if it was suffering, a human should be given the same level of compassion. A family or loved ones will come to terms with this if it is communicated to them correctly. First of all apologies for not having responded sooner as I only read this comment yesterday. The reason I didn't answer yesterday is that this is without doubt difficult to respond to. Although I'm a firm believer in the sanctity of life, I simply cannot in my position imagine how things look from a person living in your world (I suffer with pain quite often but nothing like the scale and prognosis of what you have to go through). I really hope you try your mind games and are able to find a way to make your life worth living. In your position would I have the strength to? I honesty can say and I've put a lot of thought into this. I also agree that talking things through with your loved ones or professionals is important, so they are aware of how you're thinking or feeling. Stay strong and keep in contact John. Has the swimming helped you in any way?